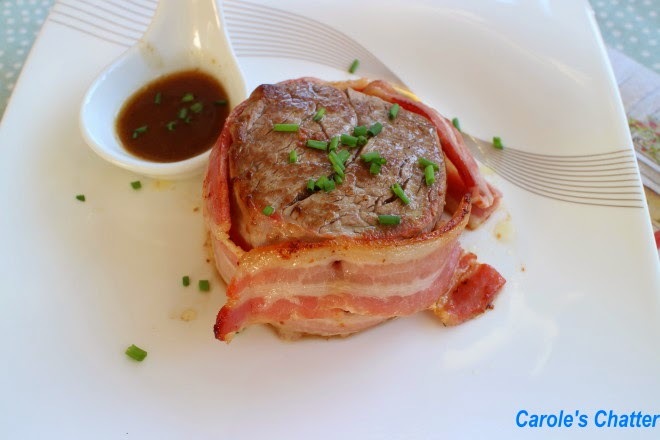 Carole's Chatter: Filet Mignon – sort of! Filet Mignon – sort of! Filet Mignon is a dish that has a real retro vibe for me. I don't often buy really expensive cuts of beef like eye fillet so this was a real treat. There were 2 glorious pieces of eye fillet marked down to half price because they needed to be used. I let the fillets come to room temperature and then patted them dry with a paper towel. 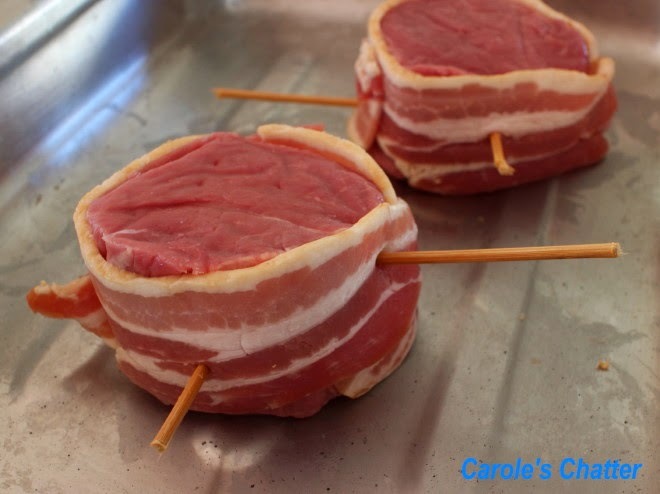 I wrapped bacon round each fillet – in this case 2 strips each because the bacon I had was quite narrow and the fillets were very thick ones. It would have been easier if the sizes had matched more closely. I secured the bacon to the fillet by a combination of bamboo skewers (soaked in water) and toothpicks. As you can see the results weren't particularly neat. Typical! I seared each side in a mix of butter and oil, then seasoned each side and popped them into a low-moderate oven to finish – covered loosely with foil. I used my trusty meat thermometer to make sure the steak got to the right amount of doneness (which for me is medium rare and for my better half a little closer to medium). I made a little gravy by deglazing the pan with ½ cup of stock (homemade chicken with a splash of Worcestershire sauce). I would have used beef stock if I'd had any. I add a small amount of wine/cognac and a touch of horseradish sauce. To thicken the sauce a little I added a teaspoon or 2 of a packet light brown gravy mix. I know – it's cheating but what the heck! The results were mouth watering. Sounds and looks delicious. Your patience with the bacon was worth it! We love Filet Mignon and your recipe looks so good! Thanks so much for sharing this awesome recipe with Full Plate Thursday. Hope you are having a great weekend and come back to see us real soon!